Templeogue Utd lose to Harold's Cross (SD). 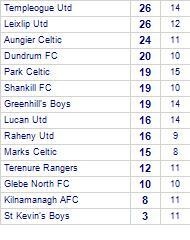 Templeogue Utd despatch Lourdes Celtic. Lourdes Celtic has yet to win in this competition, having lost all 6 games. Templeogue Utd suffer defeat to Rathcoole Boys. Templeogue Utd take spoils against Terenure Rangers. 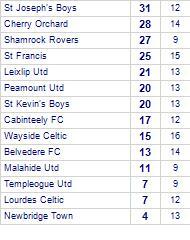 Templeogue Utd has yet to be beaten in this competition, having won 5 out of its last 7 games. Collinstown FC suffer defeat to Templeogue Utd. Ballyoulster Utd despatched by Templeogue Utd. 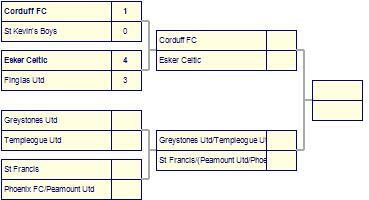 Greystones Utd are defeated by Templeogue Utd. 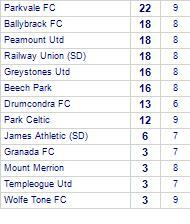 Greystones Utd has yet to win in this competition, having lost all 8 games. Knocklyon Utd lose to Templeogue Utd. 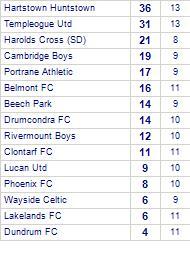 Knocklyon Utd has yet to win in this competition, having lost all 5 games. Templeogue Utd lose to Celbridge Town. 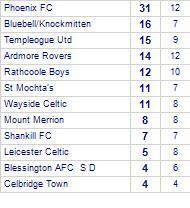 Templeogue Utd has yet to win in this competition, having lost all 5 games. 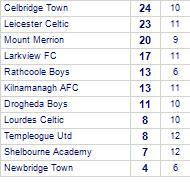 Celbridge Town has yet to be beaten in this competition, having won every game. Templeogue Utd claim victory against Cabinteely FC. 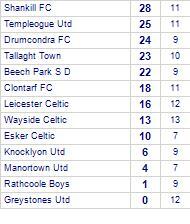 Templeogue Utd has yet to be beaten in this competition, having won every game. 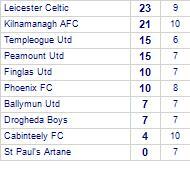 Cabinteely FC has yet to win in this competition, having lost its last 2 games. 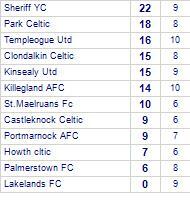 Park Celtic lose to Templeogue Utd. Rathcoole Boys suffer defeat to Templeogue Utd. 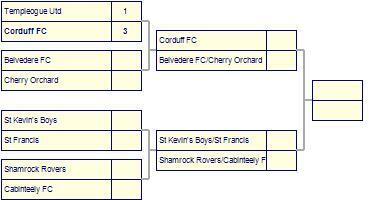 Rathcoole Boys has yet to win in this competition, having lost all 5 games. Templeogue Utd are defeated by Sheriff YC. 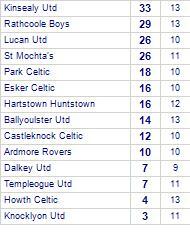 Sheriff YC are currently on a winning streak of 5 games.They have yet to be beaten away from home. Leixlip Utd beat Templeogue Utd. Templeogue Utd despatch Shelbourne Academy. 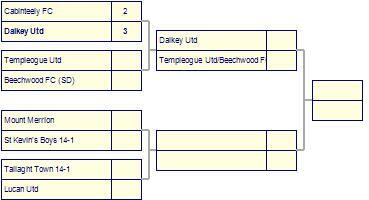 Templeogue Utd lose to Beech Park B (SD). Beech Park B (SD) has yet to be beaten in this competition, having won every game. Templeogue Utd lose to Parkvale FC. 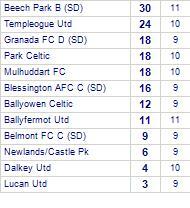 Templeogue Utd are currently on a losing streak of 4 games. Templeogue Utd suffer defeat to Tallaght Town. 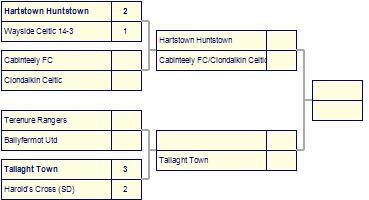 Hartstown Huntstown take all points from Templeogue Utd. Willows FC beaten by Templeogue Utd.